When you think of Digital Signage, the first question that may strike you is the flexibility of the solution. Will I be able to scale to more screens in the future? Will the media player offer support for multiple channels? Will it be cost effective? and so on...And, the answer is “YES” with Fujivision Digital Signage. The single channel player is suited to any size business that requires up to 3 small format players and displays per location or prefers to run a wireless set up rather than cabled. Beyond 3 small format players it makes better financial sense to use a multi channel player. This significantly reduces cost while giving you flexibility to scale in the future depending on your business requirements. You can further reduce cost with the wireless transmission options by cutting down on the cabling. It runs HTML5 which offers you the capability to generate dynamic content from live databases such as electronic menu board, train or bus schedules etc. You can even source content from the web such as live news or weather information. 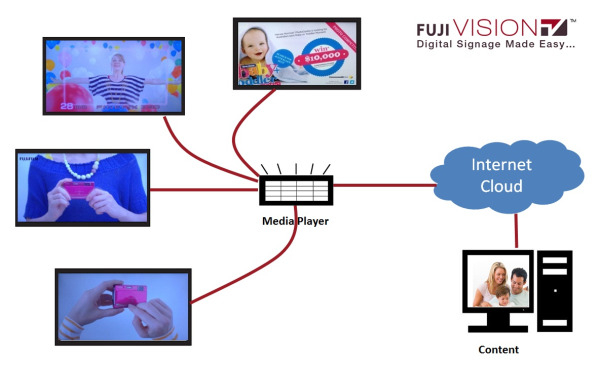 Fujivision allows you to connect to tablet or kiosk devices that can be used as end-caps to provide product information upon touch making user experience more interactive. You can set up multiple group levels such as National, State, Store or a Screen as per your business needs and update content accordingly in specific levels. Live streaming of video channels is also possible so that offering you the maximum content flexibility. Multi channel players offer all the above benefits as well as being able to manage up to 6 HD video signals per player. Thus, lowers your hardware costs when dealing with large site locations requiring multiple channels and screens running content.